Shortly before our trip to Lisbon, I checked the event calendar of the city. Sometimes you can find great events on these calendars that you might like to go to. 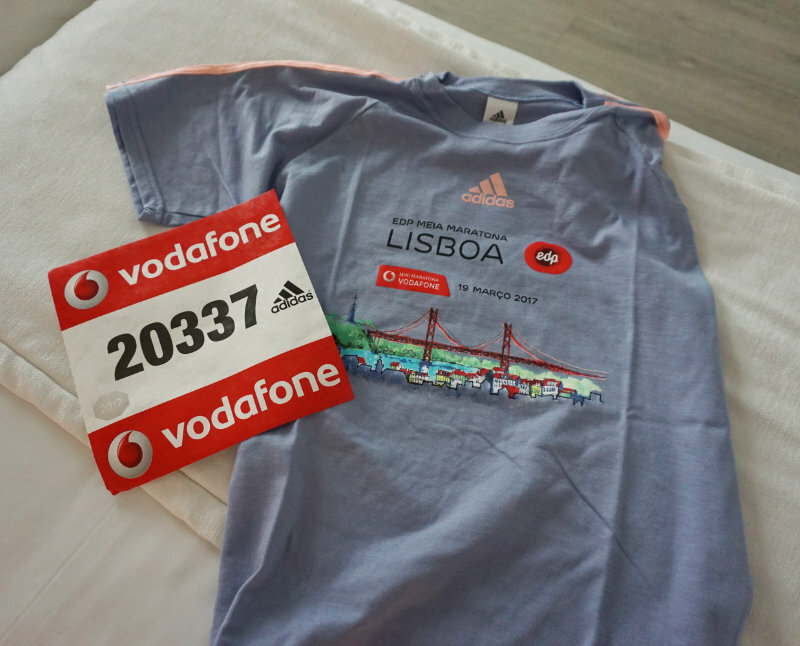 This time I had found something - on Sunday the 19th of March a half marathon was to take place in Lisbon. Actually, a great event to watch! On the website of the event, I wanted to get information on the route. Where would be a good spot to stand and observe? Doing this, the pictures of the last year caught my attention. They looked so great that I paid a little more attention to the details on the website. The run should actually go right over the bridge of April 25th. A bridge which is normally only open for cars and trains. 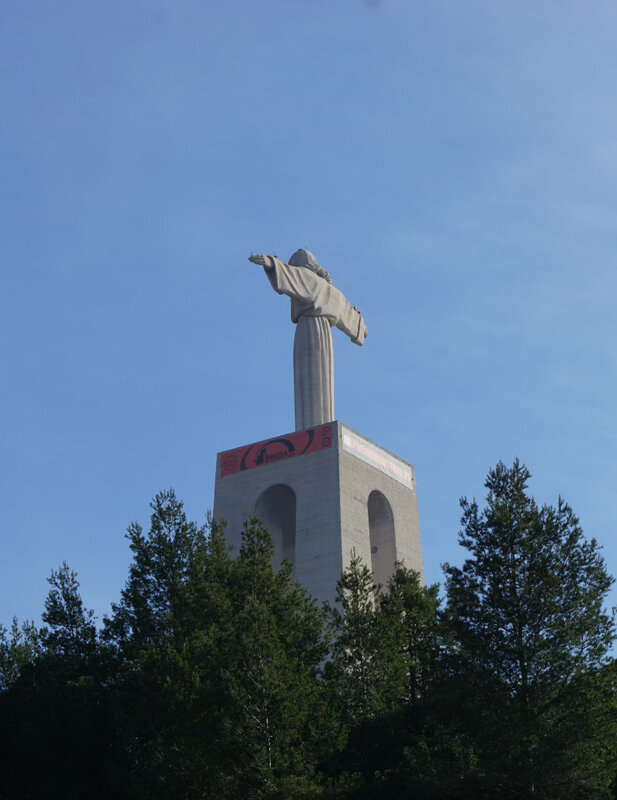 The start was supposed to be directly below the Christos statue. What a great route. 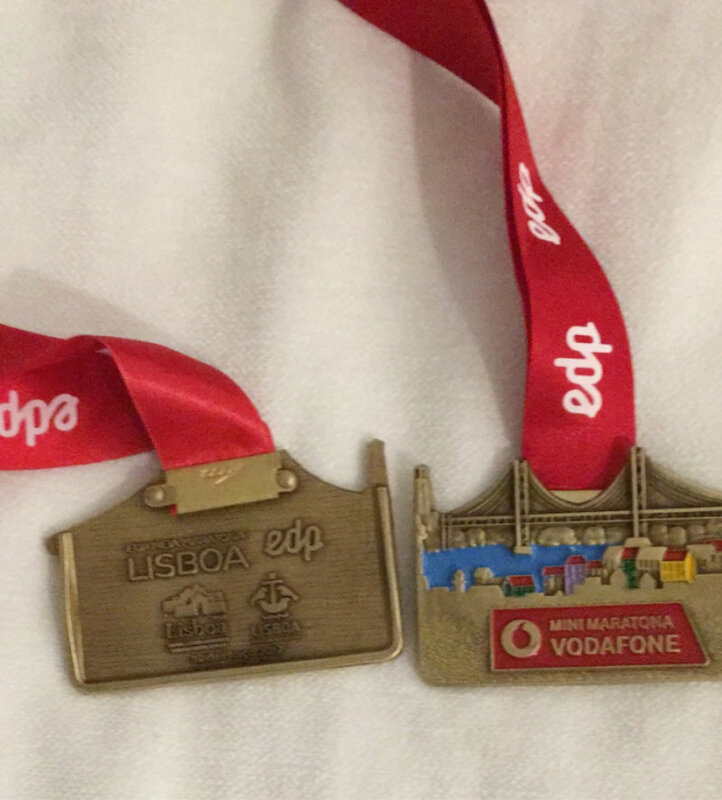 As I surfed the website, I discovered that in addition to the half marathon, the Lisbon Mini-Marathon was also on. 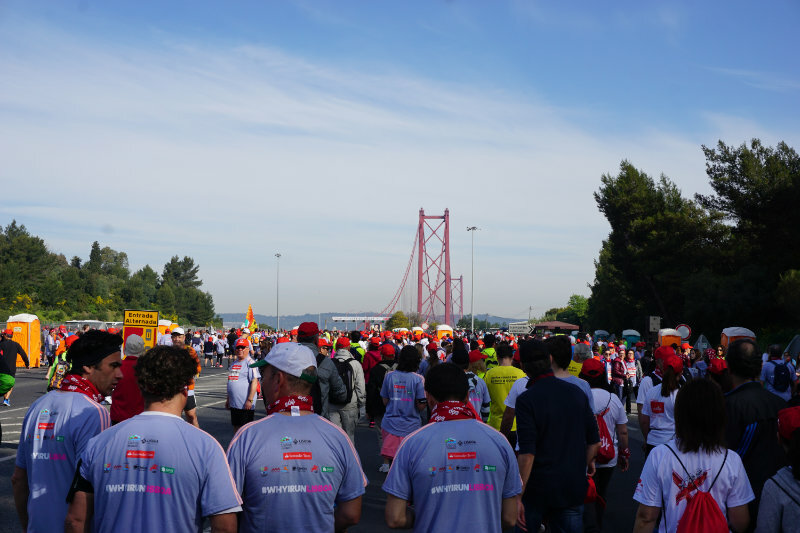 7.2 kilometres over the bridge, finishing at the monastery of Jerónimos. I decided to sign up. The chance to walk/run over the bridge, simply great! The registration is a quick and easy online procedure and soon after we received our confirmation email. 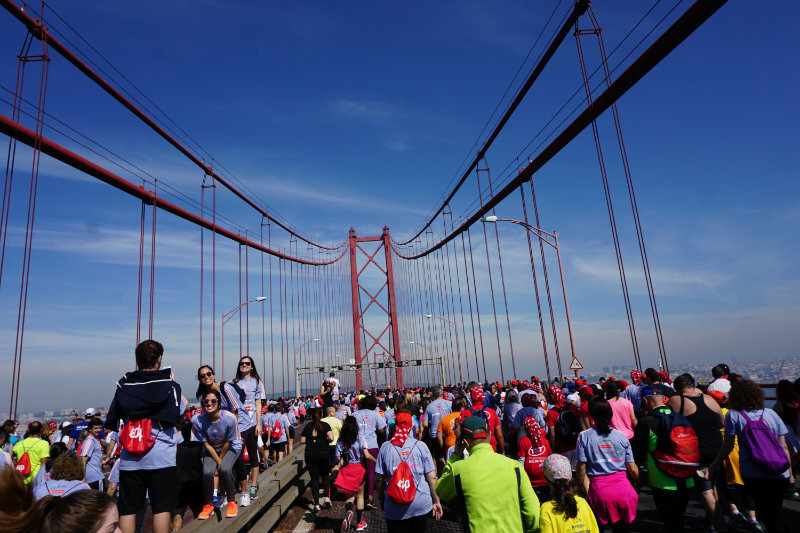 About 10 days before the run, we got another email through with more details and information on the Mini-Marathon Lisbon. With our confirmation email, we were able to pick up our runner’s bag with all the information up to 3 days before the start. The location was great for us as tourists. In the middle of the former Expo grounds in an exhibition hall. Runners were able to combine picking up their start numbers with a tour through the premises. We quickly got our starting numbers and picked up a “runner’s bag” (or as it used to be called: a gym bag) with ads of the sponsors, a T-shirt for the run and some free drinks. A starting number was supposed to entitle us to free public transport on the day of the run. Unfortunately, the more detailed information on that was only available in Portuguese, but luckily the hotel staff helped with the translation. Sunday, March 19th - 7:30 am, breakfast at the hotel. There were people in their running shirts with starting numbers pinned to them all over the place. We were wearing jeans and a T-shirt - should we maybe rethink our attitude and look more professional? Directly at our hotel is a train station of the local train service. Here we hopped on a train which brings us directly to the start of the run. The whole train is full with runners, absolutely packed! The train got us to the lower level of the bridge of the 25th April and then over into the station. Masses of people are pouring out of the train. All in running shirts and with starting numbers. Only the choice of the bottoms of some participants causes first doubts. Coming in jeans, mini skirts? Toddlers, seniors with walking aids, pregnant women with starting numbers? For the first time, the thought occurred to us that something more than the run might be taking place, more of a general gathering with the run itself just being a side note to the event. From the train, it is about 20 minutes to the starting place. Here, a large area is closed off, police everywhere and security forces constantly checking the starting numbers. If you do not have one, you will be sent back. Free baseball caps and loops were handed out. Just before the bridge, the mass of people is divided into semi-marathon runners and Mini-Marathon runners. 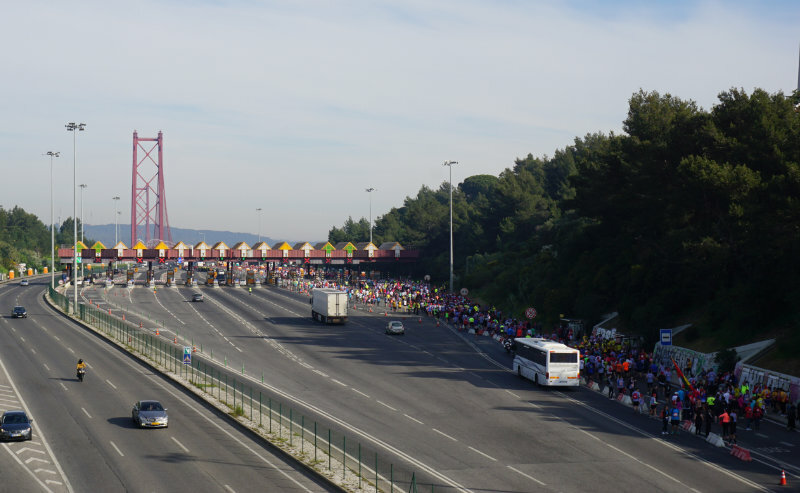 We follow the group of Mini-Marathon Lisbon runners through the toll station on the bridge to a large enclosed area. There we are, standing in the middle, which was a real drawback in retrospect for wanting to actually run. Our tip: If you want to run, you should push through to the front! Where is the starting shot? The start is at 10:30 am for the semi-marathon runners. The loud, booming music makes it impossible for us to hear a start shot. Only when all the other runners around us started moving at a moderate pace it became apparent that the run actually started. 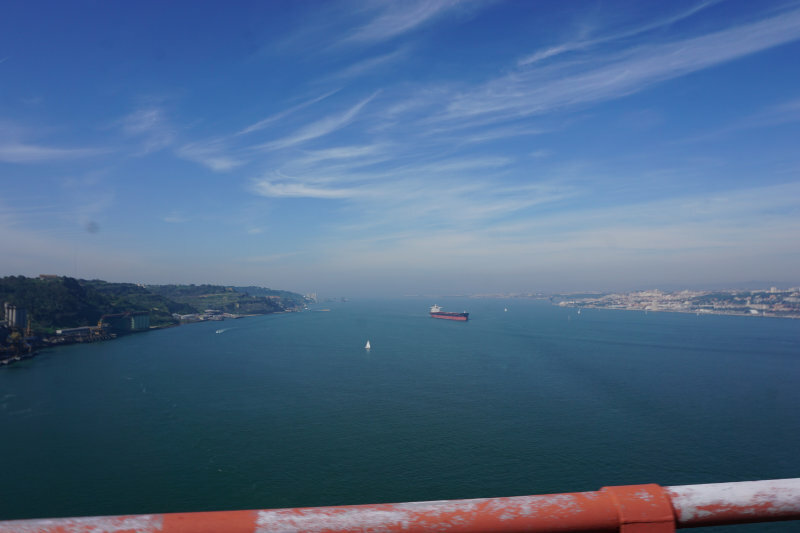 The mass of people slowly moved past the Lisbon Christos Statue on to the bridge of the 25th April. And now photography starts. 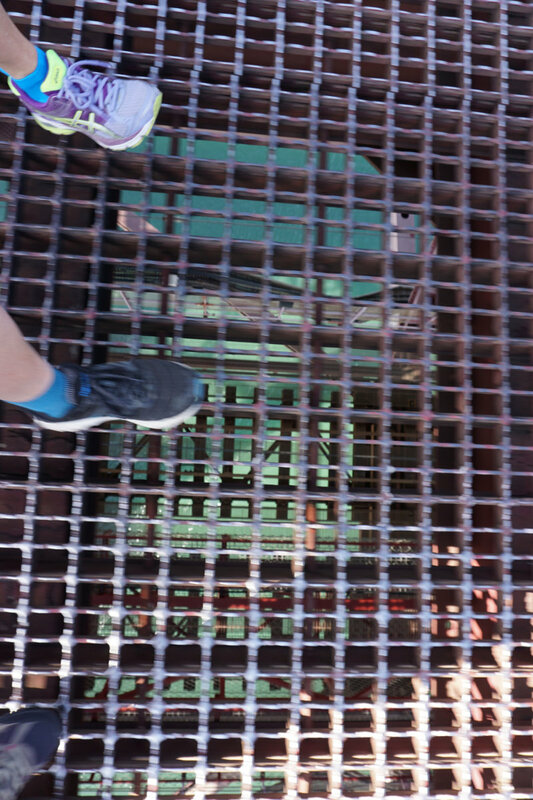 In addition to all the walkers, people started stopping everywhere, taking selfies, looking down the bridge, and carefully pushing forward over the bridge’s grids. Admittedly, the road surface of the bridge is something to get used to. In addition to two wide concrete strips, the roadway consists of grids, which allow you to look at the railway track below. Then the group of people started to spread out more so that you can zig zag through them. That stays like that until the finish line. Every now and again sprinters run past, only to then suddenly stop at random and get overtaken by us again. Whenever there is a band playing on the side of the road, runners slow down and listen. The end of our 7,2 km zig zag run was the finish line at the Jerónimos Monastery. Everyone crossing the finish line got a medal and a new runner’s bag with drinks and fruit and, to my big surprise, we all got a Magnum ice cream each. Then a short recovery - 23 degrees and blue sky - on the meadow! A great finale for the run.